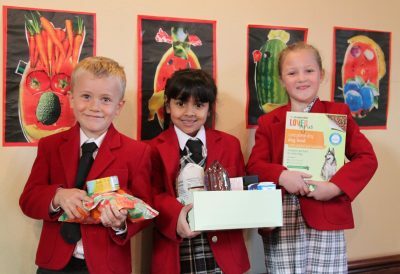 Fruits, vegetables, tins of beans and dog food are all on the way to Crawley Open House after the Harvest Festival services at Copthorne Prep. As well as bringing in lots of harvest produce, the children decorated the chapel with their ‘fruity’ artwork, tractor pictures and Arcimboldo style fruit faces. We are delighted with the generosity of the school families and one parent commented that the singing was ‘as good as a cathedral choir’!